Chris Detrick | The Salt Lake Tribune Utah Utes wide receiver Britain Covey (18) runs past USC Trojans linebacker Anthony Sarao (56) and USC Trojans tight end Tyler Petite (82) during the game at the Los Angeles Memorial Coliseum Saturday October 24, 2015. It was on a doorstep in a neighborhood in central Chile that Britain Covey balled up his fist, like he had all those days before, and knocked. The door cracked open, offering a glimpse inside, and what he saw was a slice of home. It’s one of his favorite stories to tell of the endless favorites he holds dear. Because, really, what are the odds that of all places, of all potential pieces of home decor that could catch his eye in Talca, Chile, there would be a football helmet in his line of sight? Covey couldn’t resist the connection. He said he played, the man believed him and invited him inside. There, Covey learned that football never was going to be too far away, no matter how far he was from Utah. Turns out, the man with the football helmet organized a team in town. When Covey and his companion eventually left, the man went on the Internet to confirm his hunch. At 5 foot 9, at 160-something pounds, he undoubtedly looked the missionary part. But a college football star? 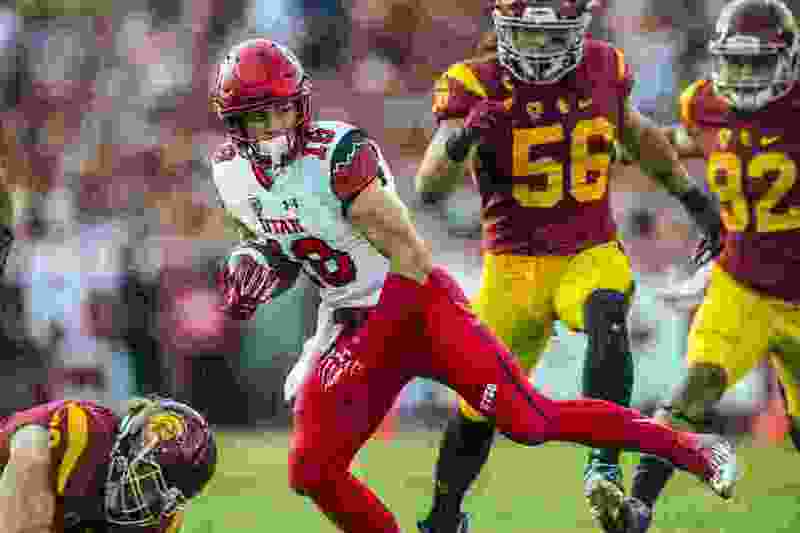 What the man soon found was reel after reel of a shifty wide receiver who captivated the Pac-12. He saw what the rest of college football did for a few months in the fall of 2015, an absurd low center of gravity that kept defenders off balance, a bewildering ability to change direction on the balls of his feet and breakaway speed that allowed him to flee a storm of would-be tacklers. “He looked up my highlights and called me and said, ‘We want you to come coach our team,’” Covey recalled this week. So on those rare free days a missionary has, Covey watched 11 players line up behind a line of scrimmage and another 11 on the other side waiting for the ball to be snapped. For a sliver of time during his two-year mission, the former freshman all-American from Provo was transported back to being a Ute. That feeling is inching even closer now. Before landing back in Salt Lake City, the Utes program dubbed March 7 “Covey Day” and littered its social media accounts with returning hype for the former Timpview High star. Even waiting for him at the bottom of the escalators at Salt Lake City International Airport were coach Kyle Whittingham, assistant coaches Guy Holliday, Fred Whittingham Jr., Kiel McDonald and highly touted freshman quarterback Jack Tuttle. Covey will not participate in spring camp, which allows him a few months to adjust to life that, at the moment, seems foreign. He’s in the early stages of a unique transition going from being humbled by two years serving others on a full-time basis to being the center of attention for thousands of devoted fans. When he first got back, he told his parents he didn’t want a cell phone for a while, didn’t want to use social media, explaining he needed time. Establishing that routine again won’t happen overnight. In the mission field, Covey said, “you’re always doing something.” If you have 10 spare minutes, you’re conditioned to utilize them properly, to go out and talk or help anyone you can find. Covey was tuned in on the couch when the Jazz beat the Pacers on the road Wednesday night and at halftime, he felt an uneasiness creep in. While in Chile, Covey and a former companion, a former professional soccer player from Uruguay, would find local futsal courts and challenge in street soccer. They had a catchphrase: “If we beat you, we teach you.” With the ball at his feet is where Covey felt that competitiveness, that swift rush of adrenaline that accompanied him when he’d line up in the slot and burst off the line. Offensive coordinator Troy Taylor hasn’t met Covey. He will Sunday when he attends Covey’s homecoming, and even Taylor lights up when imaging how Covey will fit seamlessly into his system. Utah fans are salivating to see No. 18 suit up again, but Covey is thankful he has time to get back into shape. Riding a bike around and morning workouts only go so far out in the field. He’s meeting with a personal trainer Monday to set up a two-month program to be ready for the start of fall camp. After that, he’ll swing by campus, pick up his new playbook and watch a few practices. He won’t be teaching or calling plays like hours and days in Talca, but he’ll be recognized by pretty much everyone. And no one will have to use the Internet as proof.